Germany's Greens are expected to take charge of the key state of Baden-Wuerttemberg after a humiliating defeat for Chancellor Angela Merkel's party. The Greens polled a record 24% in the south-western state, which Mrs Merkel's Christian Democrats (CDU) have run for almost 58 years. Party colleagues were quick to rally around the chancellor after the vote in which nuclear power became a key issue. The Social Democrats are likely to go into coalition with the Greens. Although the CDU polled 39%, support for their national and regional coalition partner, the Free Democrats (FDP), collapsed. 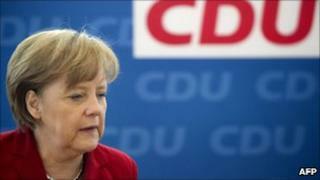 Mrs Merkel described the result as "painful". "The dreadful events in Japan, the nuclear accident in Fukushima and the consequences for us in Germany: these were the most decisive topics in this state election," FDP leader Guido Westerwelle told supporters. Christian Democrat state governor Stefan Mappus, an advocate of nuclear energy, said: "Voters were touched by the terrible events in Japan; those images still haunt people today." But the vote in the wealthy south-western state was also seen as a referendum on Mrs Merkel's rule. The chancellor's party also fared badly in elections last month, with its share of the vote plunging below 20% in Hamburg. Baden-Wuerttemberg has a population of some 11 million. It includes the city of Stuttgart, and has been ruled by the Christian Democrats since 1953. As well as enjoying a doubling of their vote in Baden-Wuerttemberg, the Greens were also celebrating a big jump in support in the western state of Rhineland-Palatinate. By trebling their support to 15%, the party is also expected to enter a coalition government with the Social Democrats who lost their majority. Winfried Kretschmann, the Green candidate expected to become the party's first state premier in Baden-Wuerttemberg, described Sunday's result as a "historic victory". The Greens were able to take advantage of a wave of hostility towards nuclear power. On Saturday, Germany witnessed some of its biggest ever anti-nuclear demonstrations. Mrs Merkel had already tried to ease concerns by suspending for three months her government's earlier decision to extend the lifetime of Germany's nuclear reactors. Four are based in Baden-Wuerttemberg. The original law to scrap nuclear power by 2022 had been taken by the previous Social Democrat government when it was in coalition with the Greens. In the days leading up to the election, Mrs Merkel's government temporarily shut down seven of Germany's 17 oldest nuclear power plants for a safety review. The decision was seen by her critics as a U-turn but CDU General Secretary Hermann Groehe said it was now unlikely the seven plants would ever be switched back on. A close ally of the chancellor, Environment Minister Norbert Roettgen, told reporters that politicians now had "to show that we can get away from nuclear energy faster and that the switch to renewable energy is possible". But EU Energy Commissioner Guenther Oettinger, a former CDU state premier in Baden-Wuerttemberg, told the Reuters news agency on Monday that the backlash against nuclear power would lead to more reliance on coal and higher carbon emissions.